Hearty, delicious and well-flavored-exactly how I would describe last night's dinner. 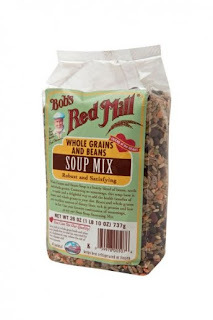 Ever since reading about Bob's Redmill soup mixes in the latest issue of Clean Eating, I've been intrigued, so I bought some to try for myself. After a few weeks of mulling over what to add to the grain and bean mix, I finally settled on chili. And oh my, was that a good decision! Soak grain and bean mix in a bowl of water for about 30 minutes. Heat olive oil in dutch oven over medium-high heat. Add onion and cook until translucent. Add garlic and cook about 2 minutes. Add seasoning, tomatoes, 5-6 cups stock and Grain and Bean mix. Bring to a simmer and cook covered for about 1 hour 30 minutes. Stir occasionally, adding stock as necessary. Serve warm with homemade cornbread! Enjoy! Can't wait to get my hands on the Vegetable and 13 Bean mixes!